I have no idea why I went for it when I had the opportunity to review All Saints, by Michael Spurlock and Jeanette Windle. I knew nothing of the story, didn’t realize it was being made into a movie except that something in the blurb said so, and the title doesn’t exactly scream out that this is going to be a story that will really move me. The subtitle might have helped. 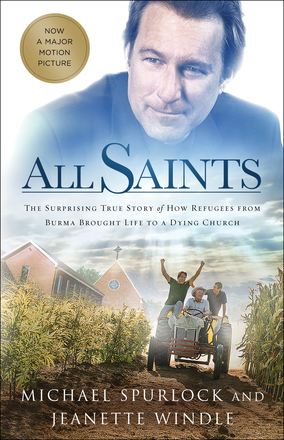 All Saints: The Surprising True Story of How Refugees from Burma Brought Life to a Dying Church. Newly ordained, Michael Spurlock's first assignment is to pastor All Saints, a struggling church with twenty-five devoted members and a mortgage well beyond its means. The best option may be to close the church rather than watch it wither any further. But when All Saints hesitantly risks welcoming a community of Karen refugees from Burma--former farmers scrambling for a fresh start in America--Michael feels they may be called to an improbable new mission. Michael must choose between closing the church and selling the property--or listening to a still, small voice challenging the people of All Saints to risk it all and provide much-needed hope to their new community. Together, they risk everything to plant seeds for a future that might just save them all. Discover the true story that inspired the film while also diving deeper into the background of the Karen people, the church, and how a community of believers rally to reach out to those in need, yet receive far more than they dared imagine. The Reverend Michael Spurlock served All Saints Episcopal Church in Smyrna, Tennessee, for three years. He is currently on the clergy staff at Saint Thomas Church Fifth Avenue in New York City. Michael, his wife, Aimee, and their two children live in New York City. Award-winning author and investigative journalist Jeanette Windle has lived in six countries, authored nineteen books, and mentors writers on five continents. To learn more, visit her at www.jeanettewindle.com. But I don’t remember actually thinking about that. I just determined this was something I should read. It arrived and I set it aside, and completely forgot about it. I ran across it a month ago, and felt guilt that I had not read and reviewed it. So one afternoon, I opened the book and started to read. I was so completely pulled into the story that I didn’t stop for much of anything. I might have made dinner, but not much else happened. Michael Spurlock is writing his own story here, or a piece of it. There’s a missionary story I’m reading with my kids for school right now, written by the missionary himself. The description of the book in our curriculum guide says something about how while the missionary is describing events that happened in his life, and describing that part of it from his point of view, they don’t believe the missionary is the protagonist in the story. He is, in fact, a fairly minor character. They argue that God is the protagonist. Waiting with anticipation and excitement to see the drama play out, to see His kingdom advance. To see light brought in to the darkness. I think that description completely applies here. Reverend Spurlock is a character in this story. An important character, surely. But God himself is the protagonist. Aren’t those the best kind of stories? In a nutshell, this story follows the life of Michael, and the life of Ye Win on the other side of the globe. Their stories intersect in a dying church in Smyrna, TN. All Saints Episcopal Church. This story also has light being brought into the darkness, or at least light coming into the dimness. Church politics, a church split – a gorgeous church building that is a shell of a church. War refugees from Burma are the ones bringing the light back. This is a truly phenomenal story, and it is a very quick read. I got this book from NetGalley awhile ago, and it was amazing! My daughter knows when a book is either really good or really bad, because I talk about it a lot, and this is one that got talked about a lot.